Sarah Kim was the top rate Korean independence movement patriot in the United States. She arrived at Sugar Plantation in Hawaii when she was in her prime age of 20 with her two brothers, Young- seung and Young-ok in 1905. She moved to San Francisco in 1912 and married Kim, Sung-kwon, a leader of Hung Sa Dahn and another prominent Korean independence patriot. 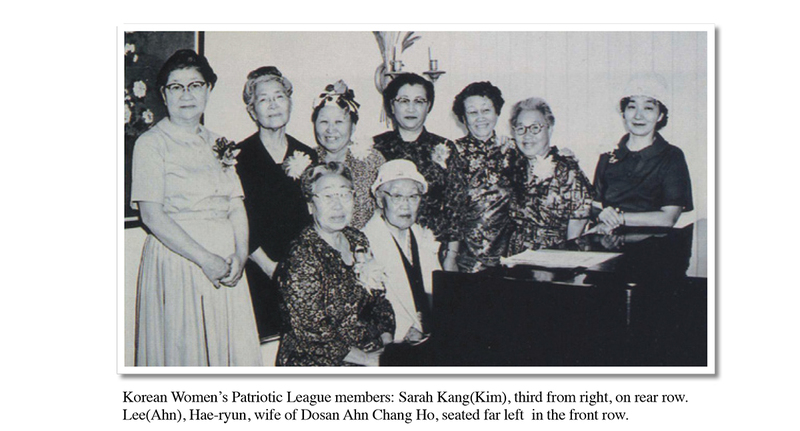 She and her brother’s wife organized a Korean Women’s Patriotic League in Dinuba. She worked full time as an alterer and dry cleaner for a living. She willingly donated her income for the Korean independence. She became the first president of the Korean Women’s Patriotic Association and she devoted her entire life for the Korean independence movement for the next 65 years of her life until she died in 1982. Her independence movement covered many regions in California including Los Angeles, San Francisco, Sacramento and Willows. During her life, she collected, managed and delivered the sum of $46,298.00 to the Provisional Government in Shanghai and its original receipt is still kept intact. She was always proud of the fact that she was hugely assisted by Dosan Ahn Chang Ho during her life. Her Hung Sa Dahn membership number is 155. She had three sons: Kim, Nak was a dental technician, Dr. Kim, In, denstist served during World War II, and Kim, Eul was a world renowned musical composer and served a Department Head at Harvard University.She moved to Los Angeles and left an indelible mark as a prominent woman leader in the cause of the Korean independence movement and education until her demise in 1982. She was buried at Rosedale Cemetery in Los Angeles. In 1995, the South Korean government posthumously recognized her efforts with the Patriotism Award for her sacrifice to instill unwavering Korean independence with the Koreans living in America. In 2016, the South Korean government repatriated her and her husband back to their homeland for permanent burial with full military honors.